High quality aqueous-based component cleaning is being delivered using two MecWash Midi component cleaning stations operated by one of the world’s leading manufacturers of automotive components. The two MecWash systems are installed at the Hungarian factory of Canadian manufacturer, Linamar, and are making a direct contribution to the processing efficiency and quality of production of alloyed steel diesel injector bodies. Importantly, the installations are delivering components in an optimum condition, precision cleaned, protected from corrosion and ready for subsequent heat treatment without the need for further washing. “As parts arrive at the cleaning station, a critical feature is first scrubbed by the operator using rotating brushes, then the parts are loaded into fixtures submerged in inhibiting solution,” he says. “When the Midis are ready to accept their next load, the fixtures are raised automatically from the solution and are transferred into the wash chamber. This approach minimises the risk of corrosion occurring when the parts are most vulnerable, prior to the wash. The two Midis at the site in Hungary have been located specifically within the electrochemical parts machining area. This not only optimises the efficiency of the process but also, because this part of the factory is separate from other manufacturing processes on site, reduces the risk of corrosion. 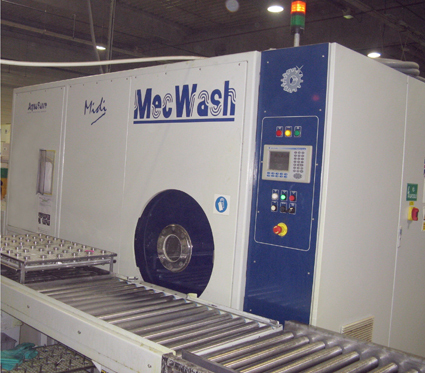 Linamar’s decision to install the second MecWash Midi within this key manufacturing area reflects this success – the further investment being a response to increased manufacturing volumes. “The Linamar name is well-respected throughout the automotive component sector so we are very pleased to be working closely with the company to deliver excellent results,” comments John Pattison. “We believe that the installations demonstrate the benefits of our aqueous cleaning technology – both in terms of processing and environmental performance. This is particularly significant given the focus on corrosion avoidance, which is at the heart of Linamar’s manufacturing excellence,” he concludes.